This is one serious tomahawk designed for tackling serious jobs. Forged from 1075 high carbon steel and finished in black, the entire tomahawk is crafted using the same single piece of metal. No welds, no bolts, no screws. Just one finely tuned piece of steel, formed into both the axe head and the handle. The front of the axe head offers a pointed cutting edge, while the back offers a piercing point with saw-like ribbing to catch-and-pull. Chop your target with the front, or pierce and pull it apart with the spike. The handle is cord wrapped for grip and impact resistance. In a survival situation, unraveling the handle can provide much needed cord for lashing, shelter supports, setting splints, and much more. Includes genuine leather sheath with belt hook. 7 in. blade, 17 in. overall. I own several tactical tomahawks but this Condor is far and away ahead of the pack. It is one solid piece of steel - you'll never have to worry about cracking or breaking the handle nor the head coming loose when you tackle those hard tasks. 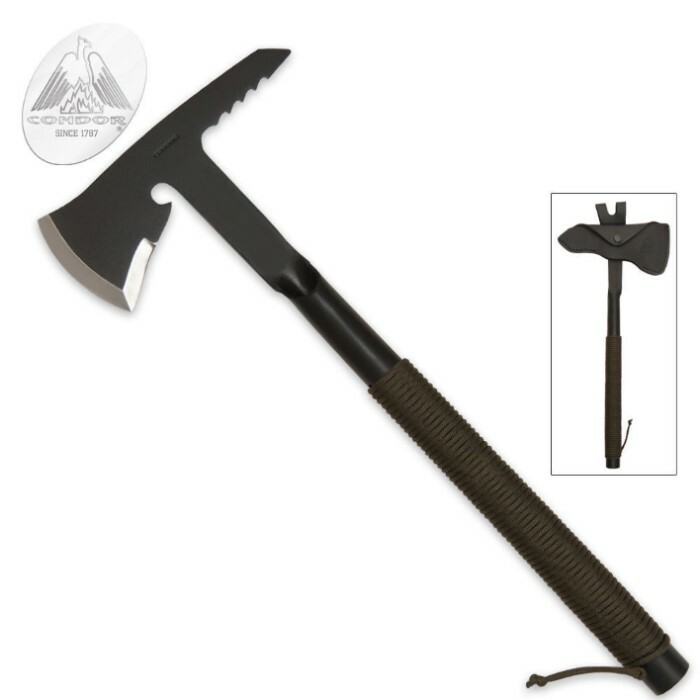 If you are looking for a work horse then the Condor Tactical Rescue Tomahawk is top choice.